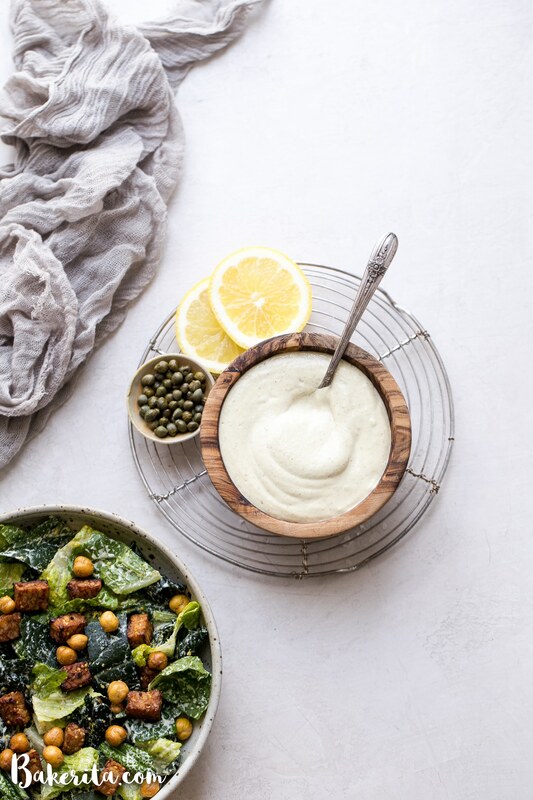 We make this creamy Vegan Caesar Dressing without any dairy, yet it maintains the creaminess you love from a classic Caesar dressing thanks to soaked cashews. The dressing is briny, salty, tart, and so delicious as a salad dressing, a dip, or spread on sandwiches and wraps. Growing up, I was never the biggest fan of creamy dressings. I usually turned my nose up at Caesar salads (despite the delicious croutons and Parmesan cheese) and anything with Caesar dressing on it. Especially if it had anchovies…I wanted it nowhere near me. 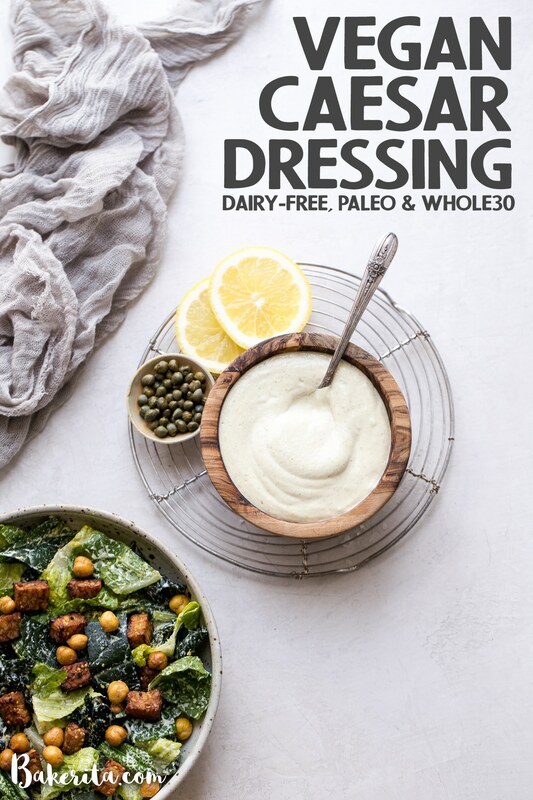 It actually wasn’t until I went dairy-free that I started to love creamier dressings. This is likely because they were made with things like cashews, hemp seeds, and other dairy-free products. These alternatives didn’t make me feel quite as blah and heavy as dairy products do. 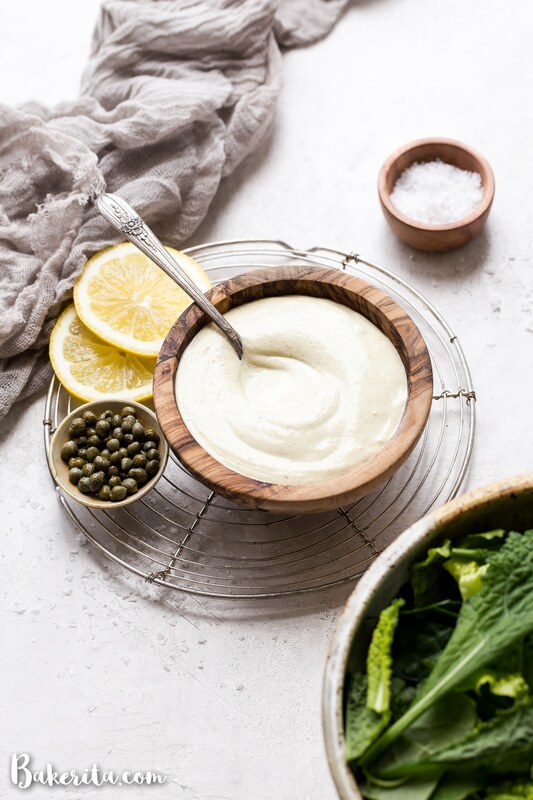 After I had an awesome vegan caesar salad at a restaurant near me, I decided to make my own vegan caesar dressing recipe. That way, I could make all the Caesar salads I wanted. The Caesar dressing could also be used for things like dipping fries and veggies into or spread it on sandwiches and wraps. Raw Cashews: these replace dairy to create a super creamy base for the dressing! Soaking will make them creamier, but it’s not necessary if you have a high-powered blender. Hemp Seeds: these add a little extra protein! Olive Oil: this is optional – makes things a little bit creamier and adds some oily smoothness. Fresh Lemon Juice: make sure you go with fresh here. We want some tartness, and the bottled stuff just doesn’t compare. I like adding the fresh lemon zest, too! Nutritional Yeast: this adds a slightly cheesy, umami flavor, almost mimicking the way Parmesan cheese would act in a Caesar salad. Capers: these add a brininess that I think makes this taste like a true Caesar salad. I recommend using capers that come in brine, as opposed to dry salted capers. You can add a little of the brine as well to amplify that briny flavor. Fresh Garlic: speaks for itself – garlic makes everything better! Add more or less to get the level of garlic flavor you love. You’ll also salt to taste, and add enough water to make the dressing as thick (or thin) as you want it. I usually end up adding about 3/4 cup of water. 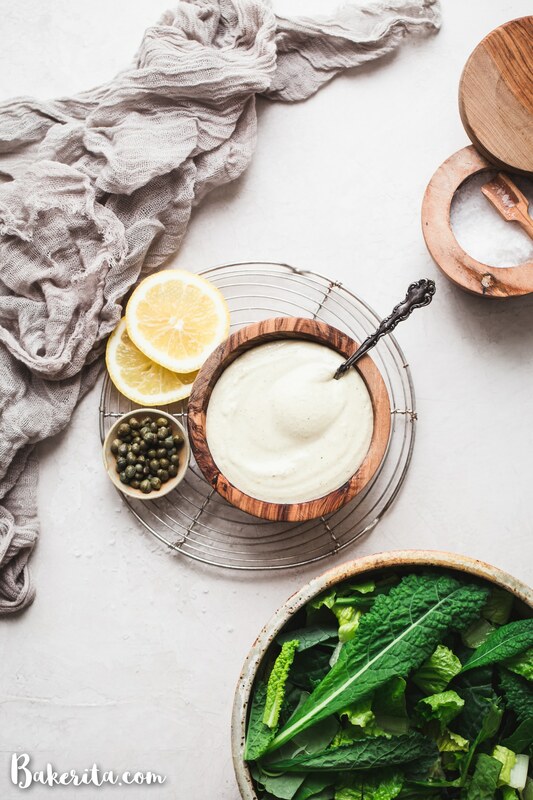 Once you’ve got your delicious vegan Caesar dressing, use it for salad (my favorite vegan Caesar salad recipe coming in a day or two! ), as a veggie dip, as a spread, or however else you can think of! Hope you love this as much as I do :) enjoy! 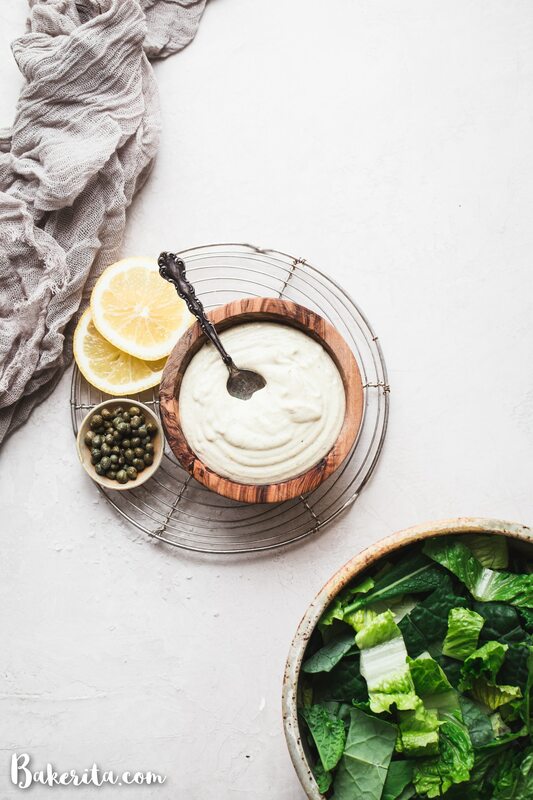 This creamy Vegan Caesar Dressing is made without any dairy, yet it maintains the creaminess you love from caesar dressing thanks to soaked cashews. The dressing is briny, salty, tart, and so delicious as a salad dressing, a dip, or spread on sandwiches and wraps. If you soaked the cashews, drain and rinse them. Add to a high-powered blender or food processor along with the rest of the ingredients, starting with just ½ cup of filtered water. Blend for 2 to 3 minutes, until completely smooth, using the tamper or scraping down the sides as necessary to get it to blend smoothly. If the dressing is thicker than you'd like, add water (or lemon juice, if you want more acidity) until you get the texture that you prefer. Add salt to taste. You can also add more garlic if you'd like, or for a more briny flavor, add more of the caper brine. Store dressing in a jar in the refrigerator for up to a week. It will thicken when chilled, so add some water to thin it out if the consistency is too thick. Nutritional information does not include olive oil. Yields 8 servings of about 2 to 3 tablespoons each (exact serving size will vary based on how much water was added). Made these and they were delicious! It tests well and good for health. I will make this again and this time I will not use Garlic. Hi Shams, so glad you enjoyed it! I like it garlicky, but that’s totally preference. So glad you’ll be making it again. Thanks for the feedback.